Railpictures.ca - A.W. Mooney Photo: CP and CN were connected in Niagara Falls by a track which ran off the CP and thru the intersection of Queen St and Erie Ave, as pictured, then along Park Ave, thru the intersection of Victoria and Bridge Sts and over to the CN yard. What is left? Not much. The CP is gone, the connector is gone, and the CN yard is gone. The CN Grimsby sub exists, of course, but now the Mayor even wants the CN Stamford sub removed. It doesn’t help that CN consistently runs long trains thru the city and they take on the continual habit of breaking down, tying up most of the downtown. The image presented here shows CP 8246 & van with a few lumber cars en route to CN. Rosbergs Dept store, on the left, is now a parking lot. And the Jeep? Well, that belongs to friend/driver Peter Hoople; who pulled over enabling me to scurry down the street for this photo. | Railpictures.ca – Canadian Railway Photography – photographie ferroviaire Canadienne. Copyright Notice: This image ©A.W. Mooney all rights reserved. 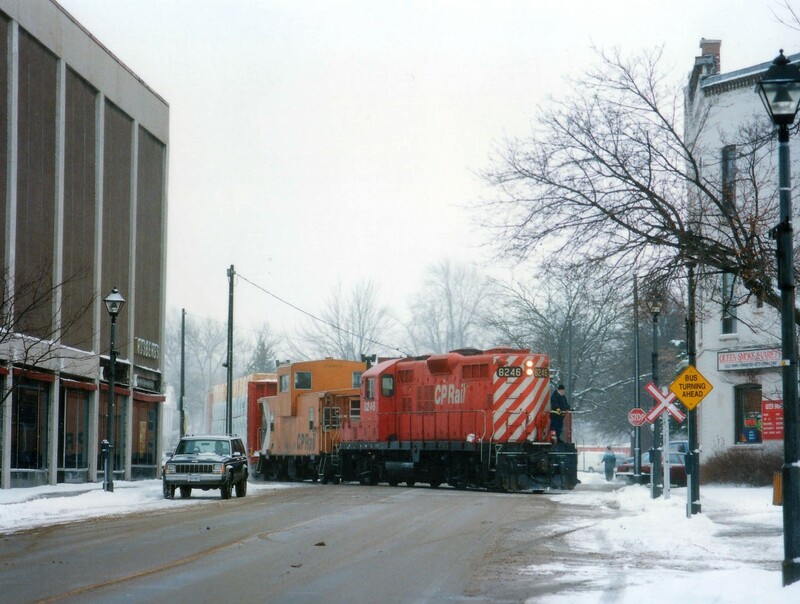 Caption: CP and CN were connected in Niagara Falls by a track which ran off the CP and thru the intersection of Queen St and Erie Ave, as pictured, then along Park Ave, thru the intersection of Victoria and Bridge Sts and over to the CN yard. What is left? Not much. The CP is gone, the connector is gone, and the CN yard is gone. The CN Grimsby sub exists, of course, but now the Mayor even wants the CN Stamford sub removed. It doesn't help that CN consistently runs long trains thru the city and they take on the continual habit of breaking down, tying up most of the downtown. The image presented here shows CP 8246 & van with a few lumber cars en route to CN. Rosbergs Dept store, on the left, is now a parking lot. And the Jeep? Well, that belongs to friend/driver Peter Hoople; who pulled over enabling me to scurry down the street for this photo. I was reading the caption, and the long trains problem can easily be solved. Bring back the NS trains to take part of 421/422′s train. After all, all of the NS’s freight that would be on it if they still ran is on 421 and 422. A most interesting picture and an enjoyable discussion. Thanks Arnold. Thanks for positive comments, guys. As far as CN thru the city, I understand that the bottlenecks caused by problems with trains could have been averted if Niagara did not do away with a couple of overpasses in the past few years. Maybe they need to lobby for funds for an underpass? The whole city is level crossings, and the other day an 11,300 ft CN train broke a knuckle right in the middle of its run thru the city. No wonder the mayor is straining his shorts. The problem in this province, and particularly in Niagara, is that doing away with essentials is not a solution to a problem. Personally I’d like CN to run trains shorter than 150 cars out of Niagara. Like two 75 car ones. That alone would make a difference. Great shot! Love seeing the pics from the good old days when CP ran through town. Neato. And, a Geep with a Jeep! Ah the great Niagara falls debate. 4 trains a day really isn’t a lot. Could you imagine if the Stamford/Grimsby subs were as busy as the Kingston sub? Sounds like a politician lobbying for support, jumping on the “railways aren’t safe” bandwagon. Debate aside, I love these old NF shots, Mr. Mooney!